The woods are lovely, dark, and deep,/ but I have promises to keep… yada yada yada. Does anyone not know this poem or who wrote it? I spent quite a bit of time carrying my heavy thoughts along with me as I wandered through the seemingly endlessly forest yesterday. mulling how hard it is to please everyone. and realized that sometimes you can’t go where you want. and I felt that perhaps I wasn’t lost after all. Still, I was cold inside so I warmed myself by the fire. As I sat there I wondered why people do thoughtless things? Why do some people see your kindness as a way to manipulate you into getting what they want? Somewhere I was taught that familiarity breeds contempt, and people take advantage of people they have contempt for. Is this true or just some platitude that has outlived it’s usefulness. Everyone says they value friendship, but there are just too many examples of people betraying friendships to serve their own ends. I’ve read recently about studies that indicate that many miscommunications occur because of incorrect reads on non-verbal communications. And all these thoughts cross my mind slowly, from different directions and then linger, heavy. I think that maybe I’m not lost after all. My human, the former decisive manager pulls on my strings. She will pressure me to do things that aren’t who I want to be. She is quick too, and this is the very thing that made her reject the corporate life. And yet, she still pressures me. She can move in on me so quickly, I can’t really stop her when she’s made up her mind. Then geez, she’s created a situation that I either must repair or just live with. and just live here as long as I can. I know a woman, a nice woman who is in love with a guy. She’s known this guy for over two years and she has told me she’s in love with him and he’s in love with her. And yet, again and again she comes to me with her distress. She doesn’t care what I’m doing, she just comes to me and rants about how she’s had it with him. The words vary, but the idea is the same, he did something inconsiderate or he went somewhere without telling her or … well, it goes on. And then there’s a showdown planned when he returns in the next day. And then there’s the show down and everything is glorious until a week or ten days later, and it all repeats again. So many heavy thoughts. 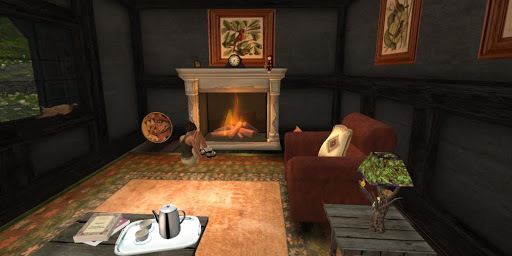 And there are so many of us here in Second Life with real life health problems or financial problems. And so many of us are lonely. I can’t even count the number. I head east for awhile. As I climb up a bluff overlooking the ocean, I see civilization. Like the poem, I will always keep my promises. But I’m not the same kind of person I was two weeks ago. I’ve come to recognize that I don’t know people as well as I believed I did. I realize now, I must leave all those heavy thoughts right here in this forest and move on. 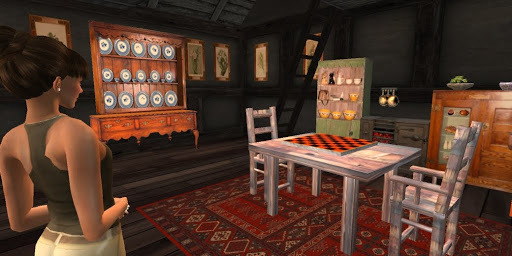 This entry was posted in Journal and tagged Beautiful Regions, Exploring, Photography, Second Life, Treasures. Bookmark the permalink.